Above: George Mitchell and two students at Langston Hughes Elementary School on book-bag giveaway day. School closures have been a hot topic in Baltimore over the last few months after officials announced the closure of five city schools in December. But one school has not accepted the school board’s decision to shut its doors. 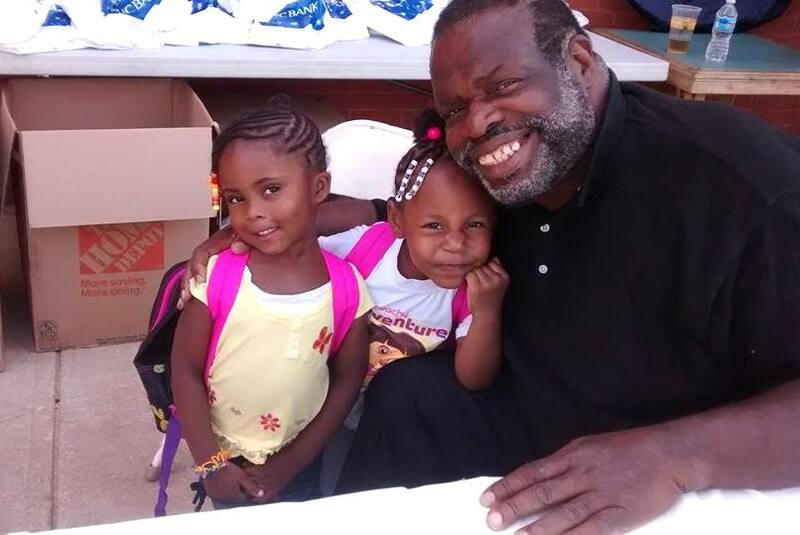 George Mitchell, who runs an after-school program at Langston Hughes Elementary near Park Heights, is not giving up on his school without a fight. 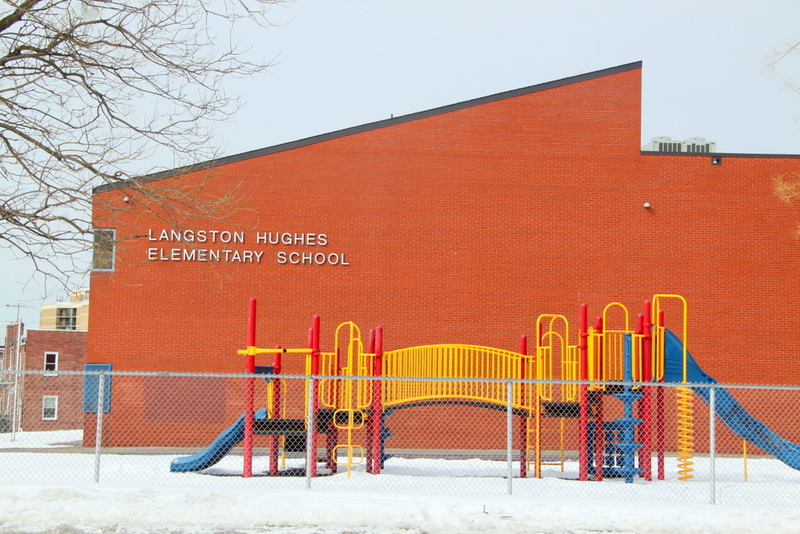 “Langston Hughes is working for the students in our community,” he said of the small elementary school on Arbutus Avenue in the neighborhood named after the iconic African-American poet. “Not all city schools can say that. Langston Hughes works on a number of levels” despite the fact that Park Heights and Pimlico are, by Mitchell’s own description, among the more drug-infested and impoverished communities in the city. Mitchell told The Brew yesterday he was seeking an injunction to stop the closure process until an appeal to the State Board of Education – filed by the Langston Hughes Community Action Association that Mitchell heads – is heard on May 12. He says a new charter school, associated with the private all-girls Roland Park Country School, has already inquired about using the school’s building as a temporary location. While enrollment at the school actually increased from 2013-14 to 2014-15, it has declined 20% since its five-year high in 2011-12 (when it had 220 students). The school currently has about 180 students. The reason numbers are down, says Mitchell, is because the school’s closure was announced in 2013. “Naturally, some parents took their kids out,” he said. Sixth District Councilwoman Sharon Green Middleton, who represents the neighborhood, said the school’s kindergarten is currently at capacity. Teresa Giles said Langston Hughes is a great school for her kindergartner, Jayla. Giles says the school is a sanctuary for the children in the crime-ridden neighborhood. “Once you step outside of the school, near the Belvedere-Garrison area, it’s not the best environment, but when the kids are inside, they learn that life doesn’t have to be this way. The staff is caring and there is an aftercare program. Every day after school everyone is doing their homework, and the older kids are helping the younger kids,” she said. The culture of the school focuses on teaching kids to be leaders and think for themselves and not follow others who make bad choices in life. “An important lesson in this neighborhood,” said Giles, who added that her plans to buy a house in the neighborhood are on hold, pending the outcome of the appeal. If Langston Hughes closes, its students will be rezoned to either Arlington Elementary or Pimlico Elementary-Middle, both about a mile away that are on track to be renovated by summer 2018. Currently, Pimlico has room for 580 more students, and Arlington for 235. The school system has said Park Heights has too many elementary/middle schools for the number of children currently living in, and expected to move to, the area. Mitchell noted that students will have to walk to their new schools, through some of the most high-crime blocks of the city. “I challenged the School Board to walk from Langston Hughes to Pimlico. They never took me up on it,” he said. The new charter school, named the Lillie Mae Carroll Jackson Charter School, recently contacted Mitchell about taking over the school building. Mitchell said wasn’t he least bit surprised because Langston Hughes, which was built in 1976, has a baseball field, a library, new roof and modern boiler system. “The building is pretty much turn-key,” he said. The new charter school is not only seeking the building, but also wants Mitchell’s support in getting it from the school system for a temporary location. “I can’t help but feel if this was a white community this wouldn’t be happening,” he said. Mitchell grew up in Baltimore’s housing projects, but he attended “good city public schools” and went on to earn a college and masters degrees and own his own business. “Education saves lives. Educated people don’t usually turn to crime,” he said, noting that he simply wants the Langston Hughes students to have a shot at a similar future. Gloria Pulley, Langston Hughes Elementary principal, told The Brew in an earlier interview that she also wants the school to stay open, but supports the school system’s decision. The Langston Hughes Community Action Association is holding a rally to save the school this Saturday (April 18) from 1-5 p.m. at 5011 Arbutus Avenue.